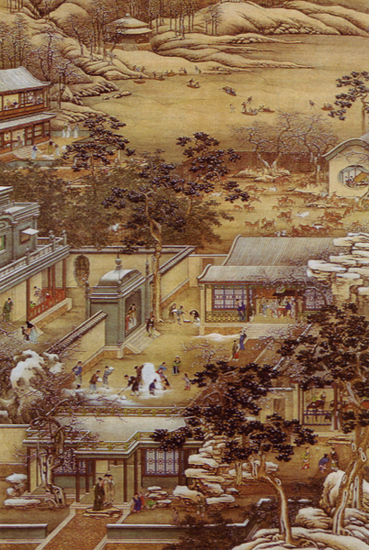 The great period of realistic painting dates from the accession of the northern Song dynasty (ad960-1127). The search for the absolute truth of nature culminated in the work of Fan Kuan (c.ad960-1026). In his Travels among Mountains and Rivers, the mountain scenery of northern China is depicted with such realism that the spectator is made to feel he is actually there. The powerful presence of the mountains is evoked in a simple and logical fashion, with particular emphasis on the vertical elements of the composition. In his Early Spring (1072), Guo Xi (c.1020-90) skilfully portrays a mountain landscape dominated by a towering peak, using gentle touches of light and shade to great effect. The carefree spirit of the painters of the early part of the dynasty is characterized by their far-reaching compositions. This was gradually lost to a stiffer style of impersonal, official court painting, which adhered to set formulae and inflexible schemes. The painters of the Academy school, founded by the emperor Hui Zong (reigned 1101-25), embodied this tendency, devoting themselves mainly to nature studies featuring flowers and birds. Li Tang (1050-1131) represents a transitional stage between these two styles; although he belonged to the Academy school, his style was still strongly individual. His great mastery of the brush influenced two major painters of the southern Song dynasty (1127-1279): Ma Yuan (active c.1180-1224), and Xia Gui (active c.1200-40), both of whom also had links with the court. With these two artists, landscapes lost strength and monumentality, and became more delicate and imbued with a sense of sadness that verged on romanticism. Nevertheless, their contribution revived contemporary-painting with the introduction of a new type of decentralized perspective. Making freer use of the brush, they employed bold, vigorous strokes to depict the sharp outlines of mountains and trees. The melancholy spirit, typical of paintings of this period, was partly owing to the new political situation that resulted after the loss of the northern regions and the establishment of a new capital at Hangzhou in the south. 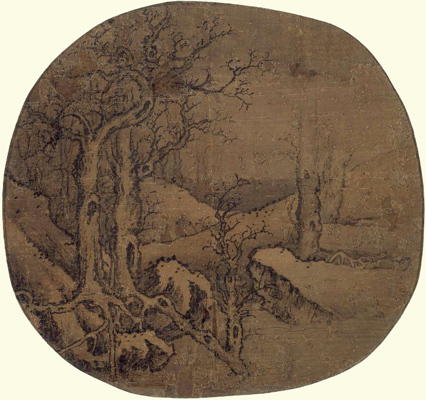 Painting, now influenced by the soft landscape of southern China, became a means of communicating thoughts and emotions rather than a precise instrument for depicting external reality. It was no longer a matter of studying and describing nature but of borrowing its forms in order to express the sensations and spirituality of the artist. This was the period of the poetic style of painting established by Wang Wei, Su Dongpo (1037-1101), also known as Su Shi, Wen Tong (1018-79), and Mi Fu (1051-1107) were among the finest exponents of this form of impressionistic art. A sense of detachment was expressed in the starkness of the brushstroke, which became almost calligraphic -a simple mark that suggested and evoked more than it described. 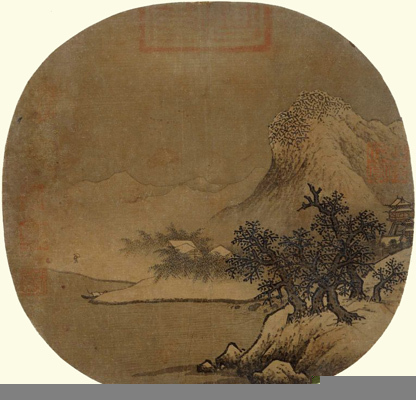 Fan Kuan (c.960-1026), Travels among Mountains and Rivers, Song period, after 1023. The skilful ink brushstrokes and refined use of colour create a very powerful atmosphere. Magpies and Hare, 1061, Song dynasty. this natural scene appears on a vertical scroll. Avalokitesuara, late Tang period. British Museum, London. 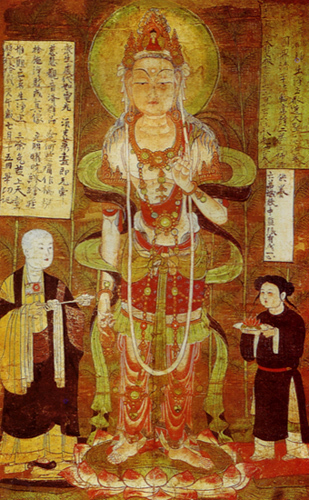 This painting on silk from Dunhuang in Gansu dates from the tenth year of the reign of Tianfu. Bamboo paper was just starting to be used at this time. Artists of the court of emperor Qianlong (reigned 1736-95), The Labours of the Twelfth Month, painted on canvas. Ancient Chinese monuments, whether great palaces, temples, or small private dwellings, were characterized by the repetition of units. Even in the case of the simplest of houses, the design followed an arrangement of similar-sized rooms. The standard unit was the jian, a rectangular room or space enclosed by walls or columns. In the most ancient period, the jian measured approximately 3x6 metres (9,5 x 19 ft), but after the Tang dynasty the dimensions grew progressively bigger. The system of repeating these areas along a horizontal or longitudinal axis was a characteristic feature of the imposing pavilions (ting) of the great palaces and temples, providing large rooms of harmonious proportions. The buildings were almost never isolated but planned in groups based on precise coordinates; with covered passageways to connect one pavilion with the next. The result was a system of linked but separate structures - a blueprint very different from that of Western architecture, in which various functions tended to be united under the same roof. The sequence of pavilions was generally connected along a longitudinal axis facing south or southeast, interspersed by a succession of courtyards. In the centre was the principal building, with the lesser ones placed to its right and left, and sometimes in front or behind it. Elsewhere, there might be a central building at the meeting point of two axes, with the secondary buildings placed around on all sides. In one quite common type of habitation, typical of northern China, the buildings were constructed around the four sides of one central square or rectangular courtyard. In more important residences, groups of smaller buildings with courtyards might be assembled around the central construction. cave temples of Yungang (Shanxi) under the Wei dynasty, the full, sensual forms found in Indian sculpture were interpreted in a more two-dimensional style. The combination of Buddhist art with the Chinese linear painting tradition resulted in a new form of expression. The stylization and spiritualiza-tion of figures became even more pronounced from the end of the fifth century, as seen in the caves (if Longmen in Henan and in the surviving bronze images of the time. During the Tang period. Buddhism reached its greatest development, although only a few specimens are known of the great seventh and eighth century pieces of bronze, wood, and clay sculpture. This is due largely to the purge of Buddhist art in the ninth century. Surviving pieces of sculpture from the Tang era include the beautiful mingqi-tiny glazed or painted figures that had been placed in tombs as part of the funerary furnishings since the Han period. 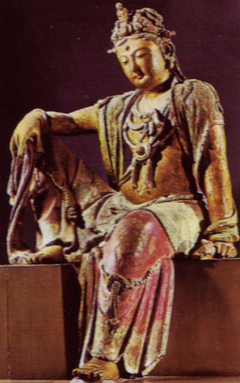 Many splendid examples of wooden religious sculptures were produced during the Song dynasty: one of the more popular subjects of the 12th and 13th centuries was Guanyin, the merciful Bodhisattva. depicted standing or seated in a pose that evokes great serenity and dignity. 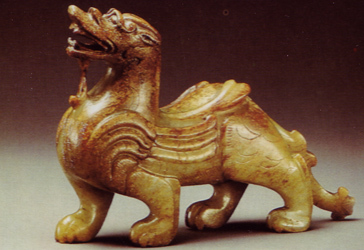 Small nephrite figure of a chimaera, Han period.